The Tubercolossus (Tuber colossus) is a boss-monster. 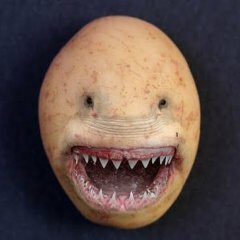 An average Tubercolossus begins its life as simply a large potato living underground. However, when the Tubercolossus reaches the age of three, it gains sentience and a hunger for more than just nutrients. Most Tubercolossi have a unique way of catching heroes. The will leave their small potato plant above the ground, and when a hero comes to pick it for food, the Tubercolossus bursts from the ground, eats the surprised hero or heroine, and returns underground to wait for the next hero to wander past. This page was last edited on 27 February 2019, at 14:12.